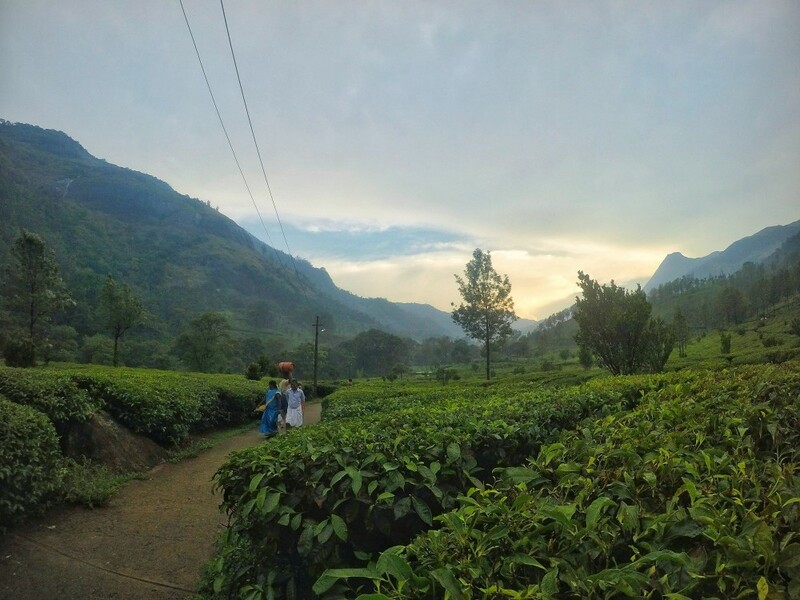 Munnar is one of the most popular hill stations in South India and while you will find a lot of tourists here throughout the year, I am happy to tell you that it is still possible to find a little peace in this increasingly famous place! You just need to have a knack for exploring and getting down at random stops and you can easily avoid crowds and have the best time of your life. 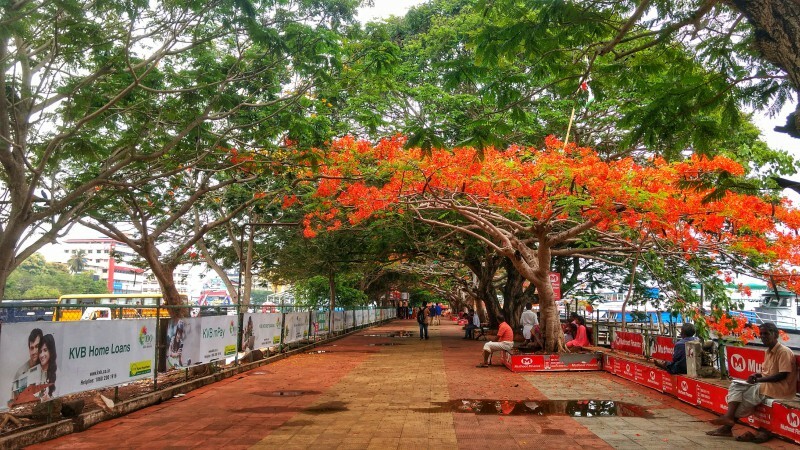 Kochi is another beautiful city which will spark the cultural thirst in you and it’s beautiful colonial styled streets and buildings will make you feel like you have transported back a few centuries. You have amazing beaches here to chill at and many beautiful forts and churches to admire. So, are you excited to visit these two places? With the help of our guide, you can plan a perfect trip to both of these places and enjoy the most out of it! There are a few ways to reach Kochi and Munar. We have covered all the modes of transport for you so that you can choose the best one for yourself! If you are coming from a bit far, then this is the most convenient and fastest way to reach Kochi. You can find many amazing flight deals also if you plan ahead of time. Kochi has an International airport named so you can take a flight from your city to this place. Ideally, a return flight ticket from anywhere inside India shouldn’t cost you more than 2000-6000 INR. If you aren’t interested in paying a high price to reach Kochi and have enough time with you, then you can take a train to the Ernakulam Railway Station. This station is well connected to several other major cities’ railway stations like Bengaluru, Chennai, Hyderabad. However, it takes a lot of time to reach by train so plan accordingly. You can easily travel via train in just 1000 INR if you aren’t looking for too much luxury. If you are a daredevil like me and really don’t care about comfort, then you can also choose to go in a sleeper or in a general coach. A general coach will cost you just 185 INR from Bangalore. Another way to reach Kochi is by bus or taking your own car. The road is pretty good and smooth so you can easily drive here with your car else you can just book a bus. You will find a lot of buses connected Ernakulum to Bengaluru, Chennai, etc. You will find many public and private buses to reach here. A public bus will cost you around 500-600 INR for the journey while a private bus will cost you around 900-1500 INR. For reaching Munnar, you will need to reach Kochi/Ernakulam. Once you have reached Kochi, you can take a bus to Munnar. You will find a bus stop near Ernakulum railway station and airport and many buses going from Ernakulum Bus station. It takes around 5 hours to reach Munnar from Kochi and the first bus leaves at 5:00 a.m. After that, you will find one bus going to Munnar in every half or one hour. If you are a large group of people then you can also hire a small bus for yourself or you can take your own cars from Kochi. Please Note: Since Munnar is a little farther away from Kochi and doesn’t have any direct route to it, there are fewer direct buses to Munnar and usually costs around 2000 INR. However, you can travel to Kochi and then take a local bus from there, this would cost you just 600-1000 for a bus to Kochi and then another 100 INR for traveling to Munnar from Kochi. 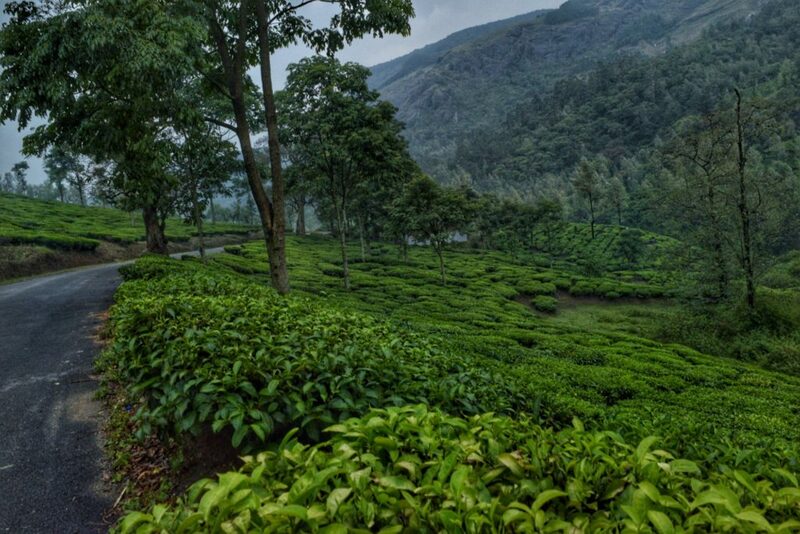 When you hear Munnar, the first thing that comes to one’s mind is the wide expanse of tea estates. You will find so many beautiful tea estates here which will be a welcome change for your sore eyes. The hills will be adorned in green color and the wind will blow around enveloping you in a cool embrace. Yes, that’s what coming to Munnar feels like, as if you have just entered a natural refrigerator. You can watch one of the most gorgeous sunsets here when you are surrounded by the tea estates. The sky turns a beautiful shade of orange, red, purple and so on and gives off an ethereal glow while the leaves of the tea plants reflect this golden hue and allow you to witness one of the most beautiful moments ever. Trust me, I never knew that you could enjoy a sunset without really seeing the sun but in Munnar, I did just that and it was one of the most beautiful things I have ever witnessed. Although this waterfall is usually crowded as this is the only major waterfall near Munnar but if you reach a little early then you can easily enjoy a little peace and quiet here. The water is clean and cool and you would feel rejuvenated after taking bath in this. In fact, if you aren’t a big fan of taking a dip in a public waterfall in front of strangers, you can still just sit on the rocks near the waterfall and give yourself a chance to refresh and enjoy the cool breeze that flows around this area. Another main attraction in Munnar is the Eravikulum National Park which is known to have a variety of amazing animals. This park is situated near the Lakkam Waterfalls and can easily take half a day of your time. You will find here a few animals if you are lucky but otherwise, it is a good place to spend some time at. Please Note: This national park has a limit on the number of visitors that are allowed to visit here every day. So if you are here for just a few days, it would be better to get up early and get your ticket else you might miss out on this amazing place. Special 2018 Update: If you are heading towards Eravikulam National Park from July to October then you will get to witness one of the most beautiful sights ever. A special flower species, Neelakurinji, which happens to bloom once in every 12 years has carpeted the park area currently. This flower has a mesmerizing smell and a magical blue shade. You will see the entire hill turn a shade of blue from green. As a result, the number of visitors allowed to enter the Eravikulam National Park has been limited. Only 3500 people can visit this park on a day at this time. So, you will need to get a ticket to the park before a few days to be able to enter and witness the blooming of this flower. You can trek in the park to watch Neelakurinji bloom here. But remember, the Forest Officials will be strict during at this time. Also, people will be expected to explore the park only for a limited time. Since there are so many visitors trying to visit every day, you can’t spend time indefinitely here. Apart from Munnar, you can watch this flower blooming in Kodaikanal (Tamil Nadu) and Koviloor (Kerala) too. Well, I would like to twist this statement a little and would ask you to visit the Top View StationPoint side but not the tourist spots. I would advise you to stop 2 km before the actual Top View Station Point bus stop because you will get an undisturbed view of the mountains while not being surrounded by a horde of tourists. Trust me, I thought that going to the Top View Station Point will show me something amazing but I kept struggling with tourists who had come with a similar plan. So, I walked a little away from the main spot and I could finally enjoy the view with some peace and serenity. At Yellapatty bus stop, I had one of the best fried fishes of my life. It was easy to eat, delicious and really cheap (It just cost me 60 INR!!!!). 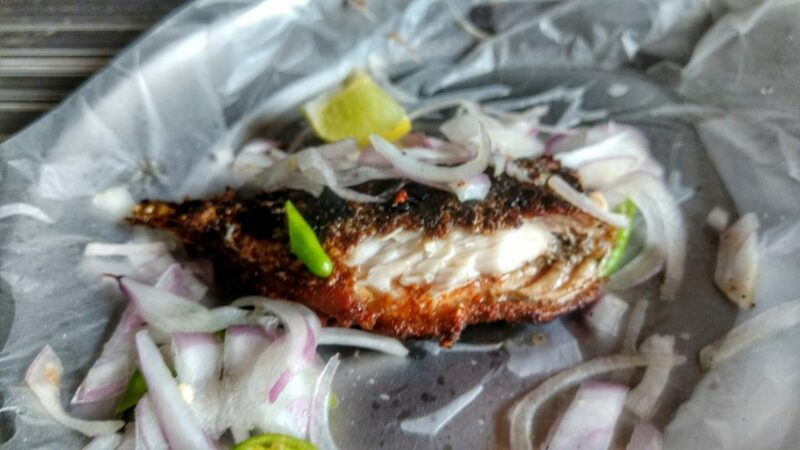 So, make sure you try the fish at a local shop to truly taste an authentic Kerala fried fish. You will find many such local shops in Kerala which serve you delicious fried fish at a cheap price. Please Note: If you want to eat fish, then you need to search for a fish shop in the afternoon because, in most places, fish is only served during the lunchtime and not the dinner time. Mostly, I would suggest that you walk a lot and enjoy these places at your own pace, there is really no need to hurry over here. The whole place is peaceful and calm and you won’t find a lot of vehicles on the road outside of Munnar so enjoy it and make the most of it. I would suggest that you get down at random stops like Yellapatty and then walk a little. You will be treated with one of the most beautiful sights ever. 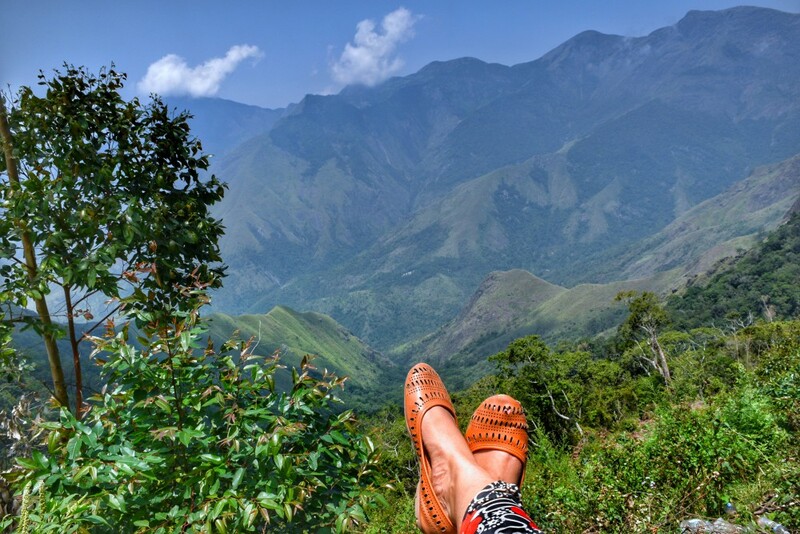 Munnar is just filled with these amazing places and views, all you have to do is be brave enough to get down at random places and walk a little. Fort Kochi is small and amazing and is filled with a lot of amazing street arts and architectures to look at. I had an amazing time exploring my surroundings while walking. So, make sure that you walk around this place because you will surely come across a lot of amazing things which you might have otherwise missed if you had traveled by a rickshaw or an auto. You can also sit down at the Kochi Fort beach and enjoy a beautiful sunset or just watch the Chinese finishing nets at work. You can also go for a walk on this beach road at night and just look out at the sea and chill. Trust me, it is really peaceful to hang out here and you just might get to witness a storm too. 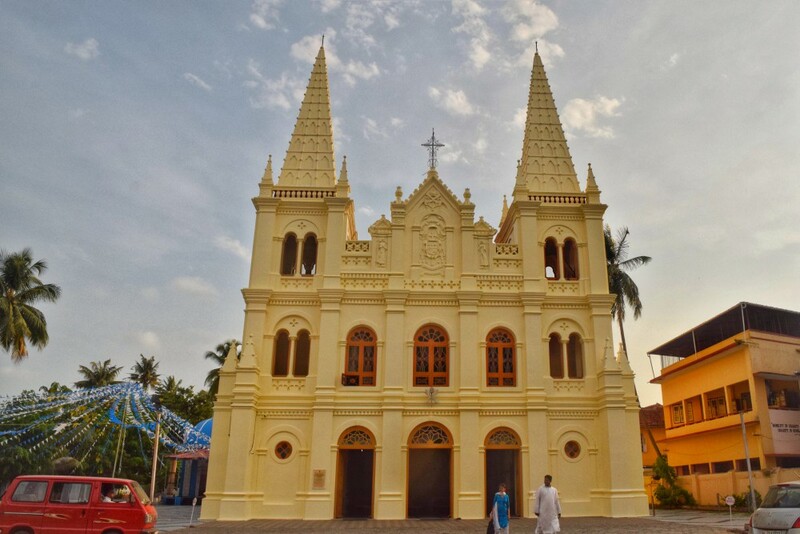 You will find many amazing monuments like the Jewish Synagogue, St. Mary’s Cathedral, fort, and so on to visit and learn about. You can also shop and eat at the Jew road and stroll around for some time. Mattunchery Palace is one amazing place to check out where you will learn the history of Kochi and how it has evolved over there years and the Jew Street is the perfect place to shop for interesting unique items to take home as souvenirs for your friends and family. Apart from Fort Kochi, Ernakulam has many amazing beaches and beachside places that one can hang out at. You can walk on the Marine Drive and eat ice cream while looking at the sea. Trust me, it’s the best combination ever!! You can also check out other beaches in Ernakulum like Cherai beach, Aniyal beach, Ambedkar beach, and so on. 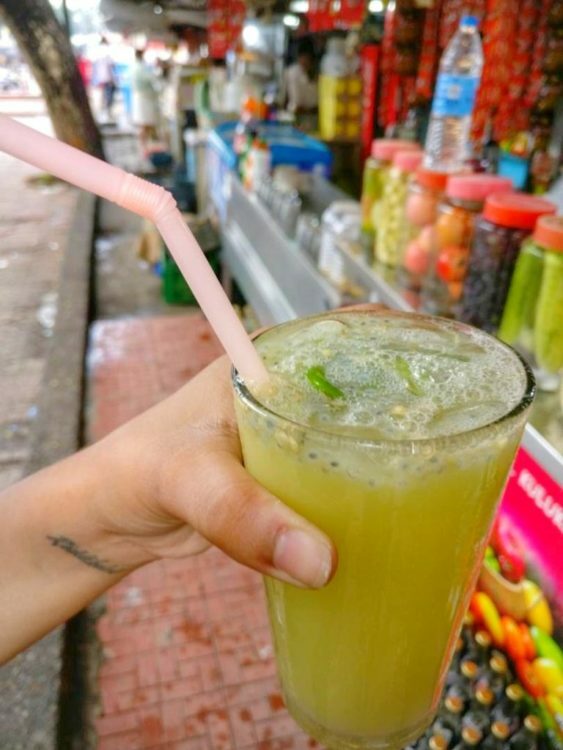 One special recommendation would be to try the Kalukki Sharbat here which is a little tangy in flavor and provides a great way to refresh yourself. You will find it in most local stalls around Ernakulum and it is quite fascinating to watch how it is made too. So, make sure you do not miss out on this amazing local drink!! Although this place doesn’t lie inside oh Kochi and is actually situated a couple of km outside it, it is one place that you shouldn’t miss out on. This place is not crowded with tourists and offers a great getaway for anyone who wants to enjoy some alone time with nature. I didn’t have enough time or means to reach this waterfall myself but if you do, please don’t miss out on this beautiful waterfalls. In Fort Kochi, you have a lot of beautiful and well-maintained restaurants but they won’t be cheap. You can also eat at the stalls which you can find throughout the city. They sell a variety of snacks which are cheap and delicious. A typical meal in a decent restaurant will set you back by 200 – 300 INR per person. 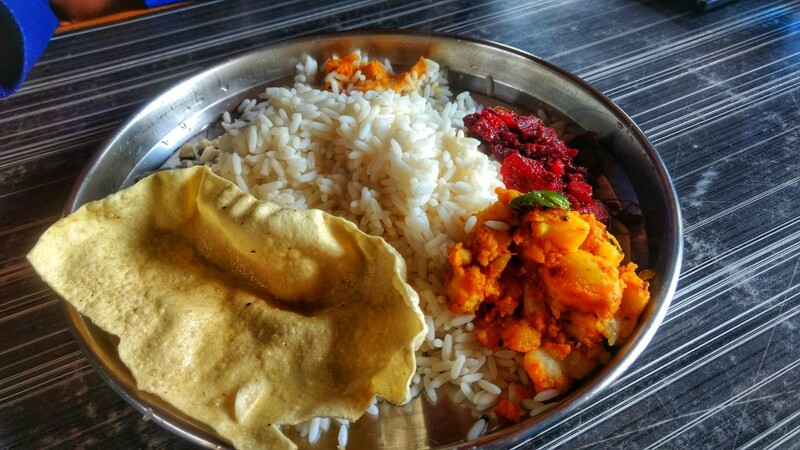 However, there are many home eatery places here too which offer you a decent lunch in just 80-100 INR. 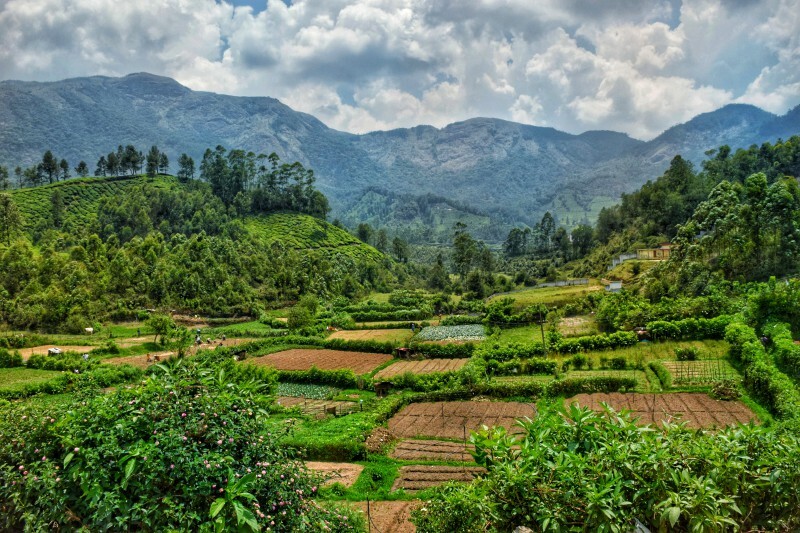 In Munnar, you will find a lot of eating joints in the main city and the market area but not many outside the city. So, if you are living a little far off from the city, you would need to eat your dinner timely. You will find here restaurants supporting all range of budgets and tastes. I particularly enjoyed having lunch at a local shop when visiting the Top Station View Point. Our lunch cost around 120 bucks which included Rice, vegetable curry, sambhar, another curry and fish and could easily be eaten by two people. You could also take a second serving and the food was really delicious. You can also try Surya Somao if you are interested in Non-Vegetarian food. A nice meal here would cost you around 100-150 INR per person. Also, you would find here many amazing bakeries to try out so don’t miss out on those. In Kochi, you would find a lot of hostel and hotels to stay at, both luxurious and budget based. You are likely to find more hostels in the Fort Kochi area and trust me, that is the area to stay in. I stayed in a hostel named Santa Maria in a 6-bed A.C dorm which cost around 300 for me per night. The hostel was amazing and provided you with free breakfast and had many books and games to interest you in. In Munnar city, the accommodation won’t be easy to find during peak season or during weekends and it would be costly too. 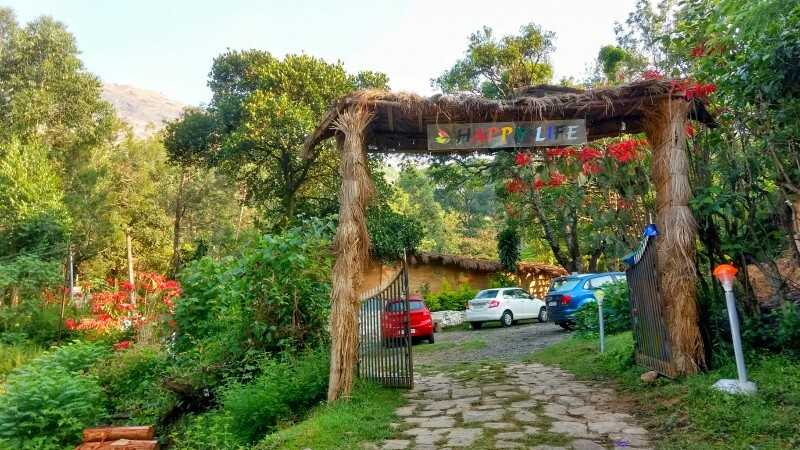 If you are looking for some quiet and not so crowded place, then I would suggest going to ‘The Happy life Retreat’. This place is situated near Lakkam Waterfalls and is around 15km from the main city area. But it is well connected with buses so you won’t have a transportation problem. It costs around 200 per night for a bed in the 6-bed dorm and includes hot water, WiFi, and dinner. Also, this place is really gorgeous and is surrounded by mountains and tea estates. I had the time of my life here as I met other travelers and just strolled around in the evening on the secluded roads. Traveling around in Kerala is pretty easy and cheap. It is well connected with buses so you are most likely to find a bus to every corner of the city. You can easily travel around Kochi using buses which are both well-connected and cheap. You will find many buses covering the Fort Kochi and Ernakulam bus station routes. If not buses, then you can use Uber or taxis here for traveling around. You can also take a ferry from Fort Kochi to Ernakulum boat point to reach quickly. For traveling in Munnar, you can easily opt for buses as all the buses go to the viewpoints. And they cost around just 20-30 INR for 40-50km. If you are staying at the retreat mentioned by me, then you can reach this place by bus too. You just need to tell the bus driver that you need to get down at the Check post near Lakkam Waterfalls. You can take a bus from this Check post to visit the various spots in Munnar. For visiting places on the Mattupatty Dam side, you will need to take a bus from the Munnar city market. If not interested in buses, then there are many tour packages you can opt for. You can also hire a cab/taxi for a day for traveling around but these options will be a little expensive. Did you find our guide helpful? Want us to add a little more details? Then, comment below and let us know how did you find our post! We will be waiting to hear from you all! Very well written… kerala is an amazing place to visit.. well in addition to fort kochi n munnar there are numerous places around kochi which one should go to. Amazing stuffs.. Thanks for all the information.. Keep Travelling..
Stay u suggested in Munnar is it dorm? Can we have privacy? Hey I’m from Kerala I felt really good after seeing this post. Hope you all enjoyed well. You can visit anytime. So we are hoping that you will be here soon. This time do more research because there are many place that you can visit nearby. Once again thank you for your post and welcome to god’s own country.